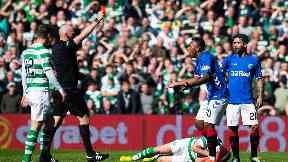 The Rangers striker was sent off for elbowing Scott Brown during the first-half at Celtic Park. Rangers striker Alfredo Morelos has apologised for being sent off in Sunday's Old Firm defeat against Celtic. The Colombian was dismissed in the first-half for elbowing Celtic captain Scott Brown and faces a four-match ban. It was the fifth time Morelos has been shown a red card this season, and manager Steven Gerrard said he wanted to fine his top scorer a week's wages and hand the cash to fans. In a social media post on Monday, the 22-year-old apologised to Rangers' coaching staff and his teammates. Morelos said: "I would like to offer an apology to all the fans, my teammates and the coaching staff for what happened in yesterday's match. "I promise to do everything in my power to ensure that nothing like that happens again and to give the club and the fans my all. "Thanks for the support and affection you've always given me."